One of the most intimidating dogs, the Doberman is also one of the most intelligent. Created in the 1890s as a guard dog, the Doberman has a storied history as protector but is now considered a great family and companion dog in addition to being one of the best guard dogs. Developed by Karl Friedrich Louis Dobermann in Germany, Dobermans were created to protect their owner. Dobermann himself was a tax collector who also ran the town’s dog pound. His access to dogs allowed him to mix and match various breeds to create a dog that was intimidating and aggressive enough to fight off bandits and others that would seek to harm the money-carrying tax man. It’s believed that he used German shepherd, Weimaraner, German shorthaired pointer, Manchester terrier, Great Dane, German pinscher and greyhound, among others. The result was an intelligent dog with enough trainability to keep it under control, yet a dog that would aggressively protect its owner on command. It maintained these traits, as well as being athletic, strong, fast, loyal and ferocious, and has been employed as a war dog, police dog and personal protection dog. Like many breeds, the war and post-war eras nearly drove the Doberman to extinction. It was saved by Werner Jung, who smuggled Dobermans from East to West Germany and continued a breeding program that most of today’s dogs descend from. Today’s Doberman maintains the intelligence of old (ranking as the fifth-most intelligent dog, according to Stanley Coren), but has been bred away from an aggressive and ferocious temperament. Today’s dog is much more of a companion animal than a working dog – although they can still intimidate and alert to the presence of intruders. They have been gaining in popularity for more than a decade and currently rank as the twelfth-most registered breed according to AKC statistics. They are medium-sized dogs with a square, compact, muscular body and possess stamina and speed. Dobermans are noble looking and carry themselves with pride. They stand 24 to 28 inches at the shoulder, and while no standard weight is defined, they tend to weigh between 60 and 90 pounds (with females being smaller). With a history of being a working dog and bred for athleticism, they require daily exercise and interaction to keep them healthy and happy. The short, hard, smooth and close-lying coat can come in several colors, including black, red, blue and fawn, with sharply defined markings appearing above the eyes, on the muzzle, throat and forechest. Dobermans enjoy a lifespan that averages 10 to 11 years. They can suffer from serious health issues, including dilated cardiomyopathy, which affects Dobermans more than any other breed – approximately 40 percent of all DCM cases involve Dobermans. 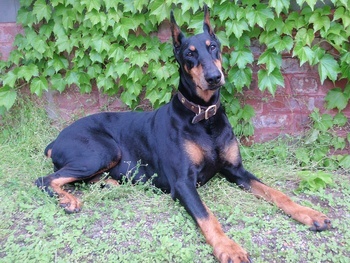 Not only is it more common in Dobermans, it’s also more serious, with a sudden death taking place relatively quickly. Dobermans are also the poster child for von Willebrand’s disease I – a blood-clotting disorder. Though the exact frequency in the overall Doberman population is unknown, 49 percent of the Dobermans tested were carriers of the mutation and 26 percent were at-risk/affected. Other serious issues include cervical vertebral instability and prostatic disease (which also affects Dobermans more than any other breed and often requires neutering as a treatment). Less serious concerns include hypothyroidism and hip dysplasia. At Paw Print Genetics, we offer a panel test that screens for five diseases that affect Dobermans, including the dreaded dilated cardiomyopathy and von Willebrand’s disease I, as well as degenerative myelopathy, dilute (D-locus) coat coloring and narcolepsy (group B). If you’re breeding a dog or thinking of buying a Doberman puppy, a panel test that screens for all five known mutations will help you select a proper mate for your dog or a litter that won’t be affected by these identified mutations – which means happier and healthier years of enjoyment with your loyal and affectionate puppy!